We, a 6 strong team, started bouncing in 2005 with the aim of becoming the UK’s specialist garden trampoline and accessories brand, delivering high quality trampolines, at a fair price, backed up with great customer service and a desire to go above and beyond what you would from a retailer. Behind the brand and working hard each day, are pictures below after our recent success in the 2010 Canmol Wales Marketing Awards. 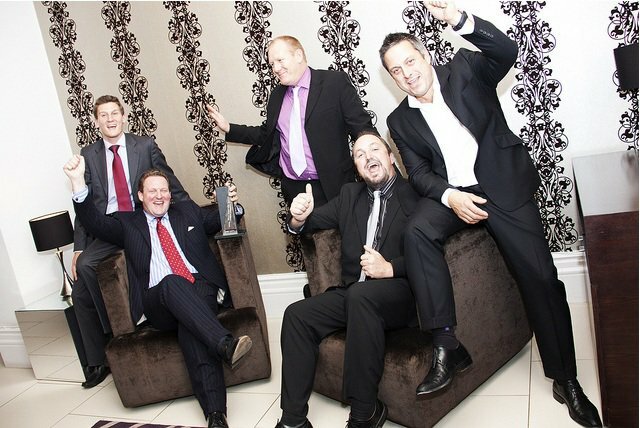 Pictured left to right are: Stephen Davis, Andrew Jardine,Glen Smith, Jonathan Edwards and George Monck. We wanted to put as much fun into providing families with trampolines as you do from using one. We wanted to answer the question “where do you buy a trampoline for the garden?” - by providing competitively priced trampolines in a range of sizes, high levels of availability, fast nationwide delivery (next day) and excellent customer service from staff who are knowledgeable and helpful. Our motto is “Serious about Fun”. All our trampolines, accessories and parts are stored in our UK warehouse and despatch center, Bounce House, in Pembrokeshire. We deliver our products to you nationwide free of charge. We are also now starting to supply products to customers in other countries such as Spain, France and Poland and have supplied trampolines to all corners of the globe. We want our brand to be known for quality and one that is fun and a bit different . We are very much an entrepreneurial business where new ideas are welcome because that is how we started, from just a simple idea. Our business is about selling fun and our team find working for us fun too. In 2010 we were awarded the Canmol: Wales Marketing Award by the Chartered Institute of Marketing. This was a great honour for us, and hopefully the first of many. You can see how much fun we had in the picture above! We love to hear from our customers, and you can see feedback in our testimonials section, so please to get in touch to let us know how you think we are doing, and more importantly what we can do better. 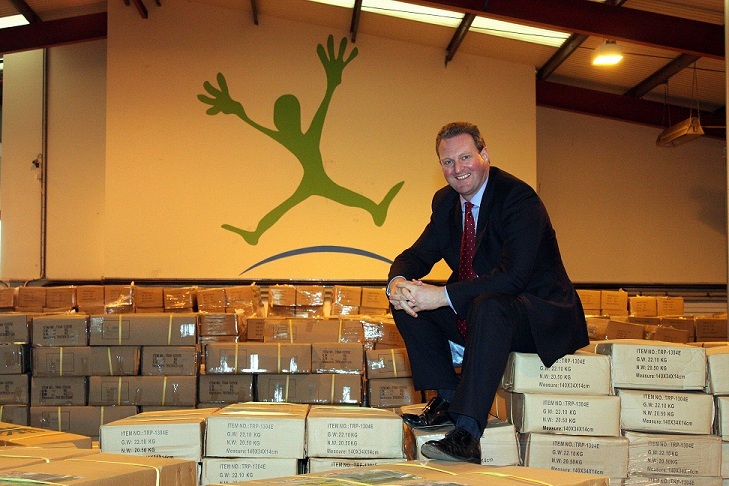 All our trampolines are kept in our warehouse in Pembroke Dock, which you can see here, which is where the company is run from. Pictured here amongst many trampolines is company director Andrew for a recent photoshoot for the Daily Telegraph who did a piece on us.